It’s been a busy week and month for the famous TRIAGLE OF FIRE the 3 lines that form a triangle over the Pacific Ocean. 95% of Great Quakes strike on these 3 lines. A month ago a quake and Tsunami hit Indonesia on the TRIANGLE OF FIRE. The other day three historic 6.5+ quakes struck near Vancover on the Triangle. 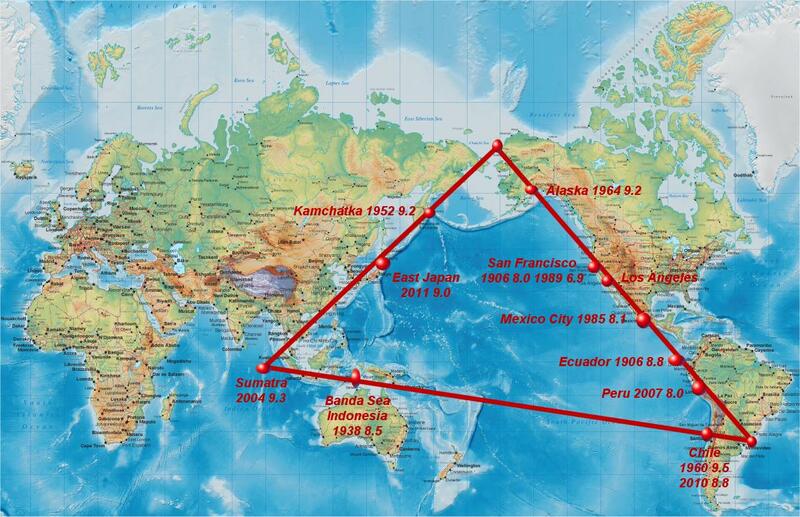 They days after a YouTube video was posted warning the Triangle would soon have major quakes. Today a Volcano erupted in Elsavador on the Triangle and a large 6.1+ quake hit the same area. Now today another plane crash has hit the Triangle as have many other plane crashes over the years. Volcanos, Large Quakes, Tsunamis and plane crashes occur over and over on just 3 lines of death and tragedy. Unlike the Bermuda Triangle that is famous for bizarre accidents of ships and planes within that triangle, this triangle is very percise as if a supernatural force is claiming thousands of lives on very precise lines of death. Lion Flight 610 took off from Jakarta a city located directly on the triangle. Most recently a Prophet named Iesou Christou appeared on YouTube warning tragedy was coming to this Triangle. Rex Luciferius released a song about this Triangle of Fire in 2016, his fans call him THE PROPHET due to his music videos show were tragic events like this strike. We have lots of Rex Luciferius articles here. For over 20 years the GREAT SOLLOG has made famous prophecies about the Triangle of Fire calling it The Triangle of Death. The Fukushima nuclear disaster from a quake and Tsunami hit on the Triangle on the exact date SOLLOG warned. The Great Tsunami of 2004 struck from a Super Quake near Sumatra on the Triangle the exact date SOLLOG warned. These are our many SOLLOG articles here. So three modern Prophets warn of tragedies like this on the Triangle and time after time they magically hit only on the same three lines. The USGS recently upgraded 18 volcanos in the USA as high alert status for near eruptions. The fact is large 7.5+ Quakes have increased almost 100% the past 20 years and the government agencies in charge of earthquake monitoring is hiding that fact. SOLLOG, Rex and Iesou have all warned to prepared for catastrophic quakes, Tsunamis and volcano eruptions on these lines. If you live on or near these lines FLEE NOW warns SOLLOG and IESOU.